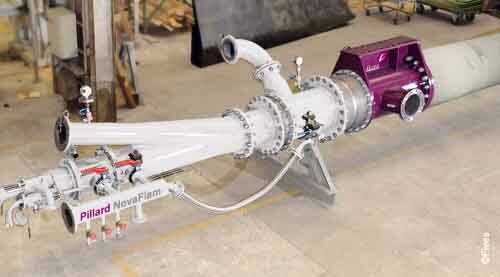 Pillard NovaFlam, Fives’ rotary kiln burner for cement plant was recently awarded the Engineered Sustainability® brand. The Engineered Sustainability® approach defines a demanding and long-term eco-design process, and leads to branding solutions which offer high levels of industrial and environmental performance with the Engineered Sustainability® mark. A clinker quality improved up to 2 Mpa higher at 3 days strength. A specific consumption reduction with 4% reduction of fuel consumption and 5% reduction of cement mill power consumption. Benefits are based on best cases studies achieved performances compared to competitive technologies previously installed. These performances are not all achievable simultaneously.